Thank you all for inviting me and to share with you. Thank you Bill and the board members for inviting me here to share a bit about the scientific basis of the human animal bond. 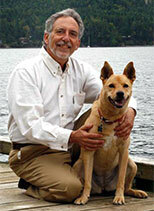 My life’s journey has been an intertwining of my veterinary career and my spiritual journey, like two strands of dna. The interconnecting bridge has been my personal quest of what is truly ultimate healing? This journey has taken me from conventional training at Cornell University College of Veterinary Medicine in western medicine and surgery to exploring and developing new approaches for animals in acupuncture, chiropractic, herbal medicine, nutrition, homeopathy, and integrative medicine. Each therapy appeared to be of benefit for various conditions that did not respond well to others. I realized that no one form of medicine had all the answers and the future was in an integrative approach, not being attached to a particular modality, but combining them in an integrative approach to offer our animal friends their best chance to heal. I also realized that physical healing was certainly one critical factor, but emotional, mental, spiritual healing was an essential part of the bigger picture of ultimate healing. Through this exploration, I realized that the immense healing abilities of the human animal bond and how critical this is in healing our animal friends, ourselves and our planet! I realized that love is truly the greatest healer. 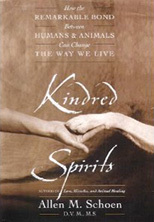 This led me to write my last book “Kindred Spirits: How the remarkable bond between humans and animals can change the way we live”. When exploring how animals help us heal, I reviewed all the research available and found that there was quite a bit of research documenting the physiological and emotional benefits of the human animal bond. I am sure most of you are aware of these studies showing that sharing your life with an animal companion can lower your blood pressure, decrease stress, increase endorphins and make one generally happier and healthier. These studies have documented the benefits of animal companions for the elderly, for single individuals, for children, for emotionally and physically challenged individuals, for prisoners, for the sick and destitute. Matter of fact, one colleague of mine, Dr. Larry Dossey once stated if that all the research documenting the health benefits of animals were all put into one pill, that would be the most documented, most efficacious pill available to humans! That is why, all of you are here! That is why more households in America are multispecies households than not! That is why we choose to share our homes, our abodes with our kindred spirits. They bring us great joy, unconditional love (varies with some cats! ), and happiness. You can have the hardest day, the most challenging human interactions and your animal friend is just so happy to see you and shower you with love, licks, purrs and affection. That is one this blessing of the animals is all about, celebrating our love with our kindred spirits. Now, I would offer you some thoughts on how we can further benefit the world through our kindred spirit connections! Our animal friends are our metaphorical connection to nature and to all that is. Technology may be essential to our physical survival in the 21st century, but the human animal bond, our kindred connection with animals is the key to our soul’s survival! If we lose that, our compassion and loving-kindness will wilt away. One teacher of mine once stated that “We fill our lives with distractions until we die, unless we wake up!” Our animal friends can be distractions on our spiritual journey to awakening or they can be our support, our catalyst, our teacher, our healer, our opportunity to awaken to all that is and nourish love and compassion. That is our choice. My invitation to you today is to recognize your kindred spirit as your teacher, healer and as an opportunity to awaken who you really are in order to be of benefit to all other beings, two-legged, four-legged and winged! One monk I happened to meet one day when I was trekking in the Himalayas, came out of nowhere, sat down next to me looking up at the snow capped peaks and suggested that during my step by step up and down the mountain journey, that I repeat to myself, “may I be blessed with enlightenment, awakening, in order to be of benefit to all other beings”. This statement repeated over and over again can have profound effects on ones mind, body, spirit and all your actions throughout your day. Functional mri’s done on Tibetan monks at top universities have shown that when one meditates on compassion for all other beings that the areas of joy and bliss in our prefrontal cortex light up. So that by being of benefit and helping others actually brings us joy and happiness. Perhaps this is why our animal friends are so happy. By bringing us happiness they are naturally happy! So in each and every moment we can choose to come from love or from fear. The more we come from love, the more we create positive neurotransmitters and neurohormones in ourselves and the happier we become. There certainly is a place for fear, if a taxicab is about to run you down, you want to get out of the way. But whenever our kindred spirits give us love, let’s close our eyes, thank them, appreciate the love they give us and then truly honor them by taking that love and sharing it with other beings that need it. Whether it is the tired cashier at the supermarket, someone having a bad hair day, so to speak, let’s smile and purr, wag our tails, and do something to shed a bit of love and light on the other. One of my favorite quotes is “may I be the type of person my dog thinks I am”. Let us all be vessels of love and light! After all, we are all connected. In the kaballah, it is said that “anything that divides is not G-d”. That is quite a profound statement. Albert Einstein said that “any separation is an optical illusion”. The illusion of being separate, alone, is what needs to be healed! The ultimate healing is realizing that we truly are all connected at a deeply profound level and no one is alone. There is no separation! So let our animal friends be our daily, moment to moment, wake up calls to awaken our hearts, minds and souls to the healing power of love and let us spread that in each and every moment of our lives and then the world will heal and be a better place. 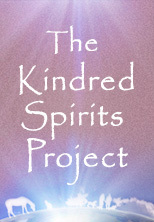 Let our kindred spirits help us realize that we are not alone, isolated, but are truly all one! Let each and everyone of us choose to be an island of love, peace and compassion to all other beings! Let each and everyone of us take the love that our kindred spirits share with us and expand that love to all others and the world will transform! Let’s choose love and honor our blessed kindred spirits! Thank you all so much for inviting me here! May you and all your animal friends all be blessed with awakening, love and happiness!